Mỹ Tho ( listen) is the capital city, center of economics, education and technology of Tiền Giang Province, located in the Mekong Delta region of South Vietnam. It has a population of approximately 169,000 in 2006 and 220,000 in 2012. 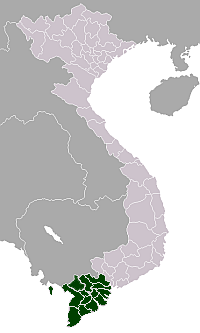 The majority ethnic group is the Kinh, and some of the Chinese, the Cham and the Khmer. Boat rides on the Mỹ Tho River are popular with tourists, and the city is known for hủ tiếu Mỹ Tho, a type of rice noodle soup. Due to its proximity to Saigon, Mỹ Tho was the traditional gateway to the Mekong Delta. In the 17th century, the city had become one of the biggest commercial hubs in today's Southern Vietnam. In 1860s, Mỹ Tho, along with Saigon, was a major strategic city during the French colonial campaign towards Vietnam. In 1862, France's capture of Mỹ Tho is regarded as the conclusion to the establishment of the French colony of Cochinchina, a development that inaugurated nearly a century of French colonial dominance in Vietnam. During the colonization period, the economy continued to prosper, attracting more immigrants, mainly from Teochew and Minnan. Mỹ Tho City is recognized as a grade II in October 7, 2005. Mỹ Tho is divided to 11 wards (called Ward 1 - Ward 10, and Ward Tân Long) and 6 communes. Mỹ Tho is connected to the rest of the country by National Route 1A and Tiền River. In here, people mainly use motorcycles, bicycles and boats for transportation. Mỹ Tho has the first railway route (about 70 km long) in Vietnam which was one of the most modern transport means in the world linking Saigon and Mỹ Tho, put into use in 1885. However, it was destroyed in 1960s. By road, Mỹ Tho City is 70 km from Vĩnh Long Province, 70 km from Ho Chi Minh City, 103 km from Cần Thơ, 179 km from Châu Đốc, 182 km from Rạch Giá, 132 km from Long Xuyên. Mỹ Tho and Bến Tre are connected by Rạch Miễu Bridge. By river, there are many short boat trips to various islands, Bến Tre, and floating markets in the surrounding areas. It also has overnight long boats to Châu Đốc and Long Xuyên. Vĩnh Tràng Temple, Cao Dai Temple, Dong Tam Snake Farm. There are four islands in the Tien River between Mỹ Tho and Bến Tre: Dragon (Con Rong), Tortoise (Con Qui), Phoenix (Con Phung) and Unicorn (Con Lan) Islands. The Mekong Delta is considered to be the "rice basket of Vietnam", contributing more than half of the nation’s rice production. Mỹ Tho is well known as floating markets, where people sell and buy things on the river, as well as Ben Tam Ngua and Mỹ Thuận market. Mỹ Tho was the first town in southern Vietnam to have a high school. The Collège de Mỹ Tho, opened in March 1879, is now called Nguyễn Đình Chiểu High School. It was one of the first schools Vietnam had, and even now is still known for its education quality among Southern schools. Later, another school called "School for Gifted Students of Tien Giang" opened in Mỹ Tho city. Though the total area is very limited compared to other schools in the province, quality of education there is usually considered one of the best. The curriculum they use is modified so that students usually learn more of their core subjects than in other schools. For instance, students from a Math class do all the required materials like any other classes, more of Chemistry, Biology and Physics because they are in the Natural Science block, and a lot more of Math. Preparation for national exams and entrance examination to the university are prioritized there. Schools in Mỹ Tho are named with famous Vietnamese writers, poets, and national heroes such as Nguyễn Trãi, Thu Khoa Huan is also known as Nguyen Huu Huan, Xuân Diệu, Lê Ngọc Hân, Nguyễn Đình Chiểu, Trần Hưng Đạo. Tiền Giang College which became Tiền Giang University in 2005 is also located at Mỹ Tho. Today the economy is based on tourism, fishing, and agricultural products such as coconuts, bananas, and longans. During World War II the French Vichy government interned foreign nationals in Mỹ Tho. In May 1945, the Japanese seized control of the camps fearing an allied attack. Foreign nationals were confined throughout the war. As the regional capital Mỹ Tho is the main market dealing in all the produce from the region as well as fish and seafood from Mỹ Tho's large ocean-going fishing fleet. The very large and exuberant market is one of South Vietnam's biggest sources for dried fish and other dried seafood products such as Kho Muc (dried squid). At night the market is dedicated to the dealing and sorting of Mekong River fish, particularly catfish for Hồ Chí Minh City's wholesale markets. Produce, especially fruit and vegetables, is delivered by boat directly to markets. It is a popular starting point for tourists to take a boat trip on the Mekong River. Mỹ Tho was the subject of "The Lesson", a chapter in a memoir by Tobias Wolff, In Pharaoh's Army: Memories of the Lost War, describing the events of the 1968 Tet Offensive there. In 2010, there are total 17 markets located in wards and commune in Mỹ Tho. General Nguyễn Khánh - former Prime Minister, General and Ambassador of South Vietnam. Madame Thiệu, the last serving First Lady of South Vietnam from 1967 to 1975 and wife of the President of South Vietnam Nguyễn Văn Thiệu. ^ "Thành phố Mỹ Tho". Mythocity.gov.vn. Archived from the original on 2013-09-01. Retrieved 2013-08-22. ^ Hoskin, John; Howland, Carol (2006). Vietnam. p. 114. ^ a b mrdanial (2012-08-09). "Get to Know the Door of Mekong Region – My Tho City". The Vietnam Guide. Retrieved 2013-08-22. ^ Lonely Planet Vietnam. 2009. p. 418. ^ "Vietnamese Nôm Preservation Foundation". Nomfoundation.org. Retrieved 2013-08-22. ^ "My Tho grade II". Thevietnamguide.com. ^ a b "My Tho". Amitourist.com. ^ "The First Railway Route in Vietnam". tuoitrenews.vn. ^ "Provinces and cities". Vietnamtourism.com. Retrieved 2013-08-22. ^ "My Tho - Long Xuyen". Maps.google.com. ^ "Floating Markets, Mekong River, Mekong delta, Mekong travel guide, Mekong river travel guide". Luxury Mekong River Cruise. Retrieved 2013-08-22. ^ "Vietnam Building Code Natural Physical & Climatic Data for Construction" (PDF) (in Vietnamese). Vietnam Institute for Building Science and Technology. Archived from the original (PDF) on 22 July 2018. Retrieved 22 July 2018. ^ "My Tho". www.footprinttravelguides.com. Retrieved 14 June 2015. ^ "MY THO - VIETNAM - MEKONG RIVER". www.luxurymekongrivercruise.com. Retrieved 14 June 2015. ^ Wolff, Tobias (1995). In Pharaoh's Army: Memories of the Lost War. Knopf. Wikimedia Commons has media related to My Tho. This page was last edited on 18 April 2019, at 09:53 (UTC).